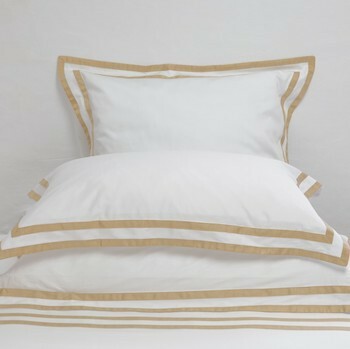 Modern-upscale tempered with bold elegance, Formentera´s 50x75cm standard oxford pillowcase has a 7cm oxford border with double applique band of honey coloured satin. Avaliable in a 280 thread count 100% Egyptain cotton sateen, our standard oxford pillowcase is the perfect place to rest your head or add as a decorative sham. Formentera´s fine sateen weave is light yet warm and so soft against your skin it´s comfortable during all weather throughout the Australian seasons. One of our favorites, it´s a delight to sink into each night and wake refreshed. Complete with look by adding a quilt cover or other shams to capture the collection’s Mediterranean style and easy living feel.